Foot warmers are the best way to help athletes, sportsmen, skiers, construction workers and anyone wanting to keep their feet warm during outdoor activities. The most popular type of foot warmers don’t need any external energy to activate and are designed to fit inside shoes or boots so that you can wear them at football games, during outdoor winter sports, camping or cold weather hunting. You can also get battery operated foot warmers that are great if you would prefer to have a product that you can reuse for many years. Reusable vs. Disposable– Our top picks include a few reusable and a few disposable products available. The better value will depend on how often you are going to be using the product. If you are only going to be using them infrequently, then you should probably stick with disposable designs. 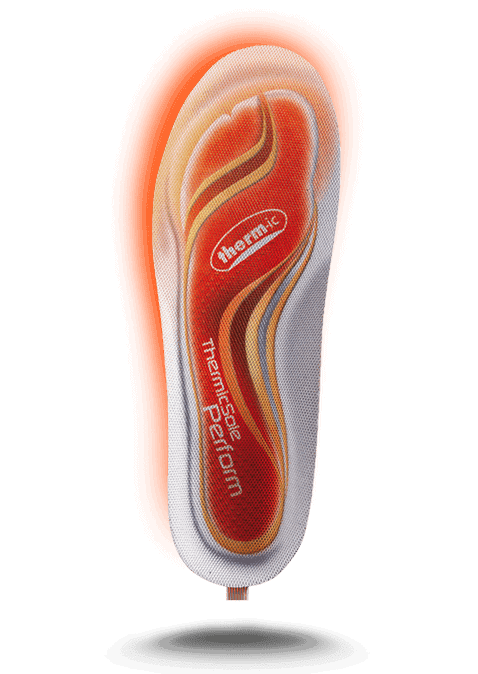 If you are using them every day, you should have a look at the Thermacell Heated Insoles. 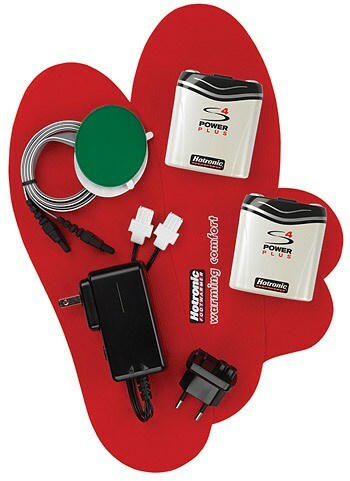 If you are skiing a lot, then you may want to look at the Hotronic Foot Warmer S4 Custom. The Thermacell and the Hotronic devices are much more expensive up front, but if you can get many years use out of them, they may end up being comparable in price to the disposable options. Uses– Foot warmers can be used for pretty much any outdoor activity you can think of. They work really well for fishing, camping, hiking, skating, skiing, and boarding. Length of time they stay warm– The amount of heat that you can get from these types of products varies from around 5 hours to a maximum of about 18 hours. Safety – There are a few safety precautions you need to follow if you are going to be using the air activated products. You aren’t supposed to apply the product directly onto the skin as it could burn the skin. Infants, the elderly and Diabetics should avoid using these types of warmers. For whatever product you buy, read and follow all instructions for use. Hothands make two types of foot warmers Hothands Foot Warmers and Hothands Insole Warmers. Their Foot style is a rectangular shape that can give up to 6 hours of continuous warmth for the feet (it looks a little bit like their hand heater and is an unusual design for these type of product). Hothands more popular model for the foot is the Insole design. The insole style is a full-length shoe warmer that is designed to fit inside shoes or boots. 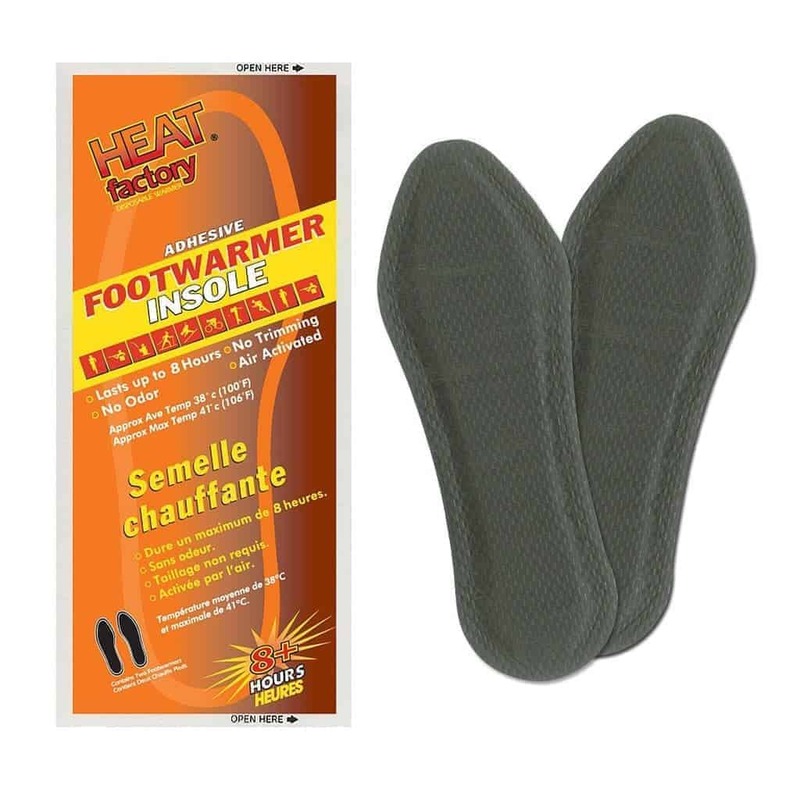 They are single-use, air-activated heat packs that provide up to 9 hours of continuous warmth for the feet. The Insoles are ultra-thin so that they will be comfortable, and you shouldn’t notice them. The ingredients in the products are iron powder, water, salt, activated charcoal, and vermiculite. The components become activated by the air and begin the reaction that produces the heat when they come out of the packaging. The only problem with the Hothands warmers is that they are one-size-fits-all, so they aren’t the best if you have very small or very large feet. The size is 9.75 in x 4.5 inches. The maximum heat it will get to is 109 F, while the average is 99 F.
Grabber and Hothands are both subsidiaries of Heatmax, Inc. Not surprisingly the two different brands are pretty similar to how they are made, pricing and packaging. The Hothands brand came out after the Grabber brand, and I think they perform a little bit better since they last 9 hours compared to the Grabbers foot warmers that will only give you 5 hours. The big advantage that the Grabbers designs have over the Hothands is that you have the option to choose a small, medium or large sizing. It is important for those users whose feet are very small or very large. They work well for hunting, fishing, camping, and hiking. The other air activated design that is worth a look is the Heat Factory design. The ingredients are the same as the Grabber and Hothands products (iron powder, charcoal, salt, and vermiculite) with the addition of sawdust. They are a soft, lightweight insole with maybe a bit more thickness than the other two brands. If left unopened they have a shelf life of approximately three years or more. Once activated, the warmers will provide heat for about 8 hours. They are one-size-fits-all, and the sizing is 8 x 3 inches. If you are looking specifically for something that would work well with a massive boot like a ski boot with a removable liner, check out the Hotronic Footwarmer S4 Custom, it is Hotronic’s newest model (it came out in 2016). This latest model is more powerful and has a longer lasting battery. If you are using it on the lowest setting, you may be able to get up to eighteen hours of heat. Another option if you are into the battery operated foot warmers are from the Austrian company Thermic. You purchase the sole and the battery pack separately. They have a few different types of soles (Classic, Trimfit, Perform and Kids) and all are one-size-fits-all, except for the Perform style which has five sizes. Once you have chosen your sole, you need to select a battery pack. There are a few different models to choose from, with the main difference being the amount of time the battery lasts and the price. Find more information here. 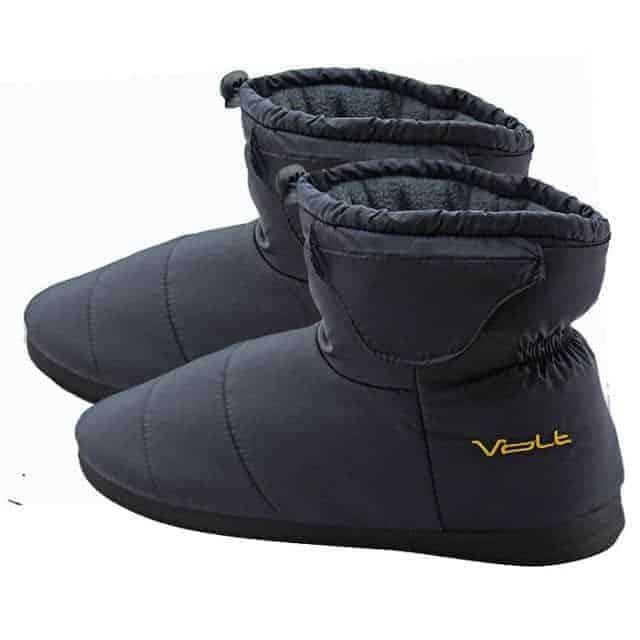 If you want a product to heat your feet while you are at home, check out the Volt Unisex Indoor/Outdoor Heated Slippers. They come in 8 different sizes and four different colors. They have a nylon fabric that is insulated with Thinsulate and fleece, as well as a drawstring closure to help keep in the heat. The bottom has a memory foam footbed with a rubber sole on the outside. They are 6 inches high and 11 inches wide. They come with four different heat levels to choose from, with up to 10 hours of heat capacity. They use two rechargeable lithium batteries (that are included) to heat, and they come with a wireless remote that lets you adjust the heat levels. They have pretty mixed reviews, but some people love them. These type of products often come in a one-size-fits-all option. Some brands to offer different sizes for different sized feet. They are designed specifically for use in winter boots and heavy shoes, so you shouldn’t have much trouble getting a pair that will fit. To warm your feet, you should look for products that are designed to warm feet. Many people like to use hand warmers on their feet, but it isn’t recommended because products that are created for your hands are made to work in an area that gets more air flow. Foot warmers are made for environments that have restricted airflow, like a boot. 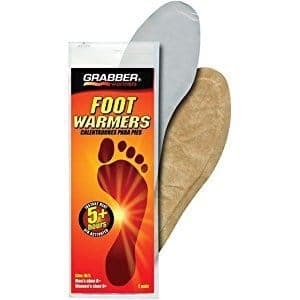 If you just have a problem with your toes getting cold (a common problem for cyclists) you should check out Toe Warmers, they will help with cold feet, and they are a little bit cheaper than foot options. Yes, as long as you are supervising the child and they understand that they should tell you if the product gets too hot. Brands that offer one-size-fits-all will probably be too big for children because you cannot trim them to be a smaller size. There are a few different kinds of hand and toe warmers, but the most popular ones contain iron, water, activated carbon, salt, a water reservoir, and vermiculite. When iron is exposed to oxygen, it begins to oxidize and produce heat. As soon as the product comes out of the package, the oxidation process begins. The heat will gradually start to build up for approximately 20 minutes. You should be able to feel the heat on your skin after a few minutes of being exposed to the air. Once it is inside the shoe or boot, it will get to heat between 100 F and 107 Fahrenheit. You should be a bit careful with foot warmers because they are intended to work in environments that have low oxygen, so if they are let out in the open too long it is possible that they reach temperatures of 165 F, which could be extremely hot if you put that into a boot or a shoe at that temperature. On the other hand, if you are having trouble getting a heating product to heat up, you can leave it out in the open to heat it, once you feel the heat start to activate you can place it in the boot or the shoe. You should follow all directions on the package to avoid serious injuries or burns. For any of the different types of warmers, you should use extreme caution and use under supervision with the elderly, infants, children, people with sensitive skin, and anyone unable to feel the heat. Consult with your doctor before using a warmer if you have diabetes, frostbite, scars, open wounds, or circulatory issues. Remove product immediately if they become too hot or feel uncomfortable. Don’t try to open the pouch on the air activated warmers; if they do become open don’t let the ingredients come in contact with your eyes or mouth. Keep all warmers out of reach of children and pets. If any of the ingredients of the disposable product are swallowed, call a poison control center immediately. Foot warmers are well worth the investment whether you have to spend hours outside working or you enjoying hunting, skiing, boarding, or hiking in cold weather. You will be surprised at how much these products can improve the experience of a severe weather outdoor activity.